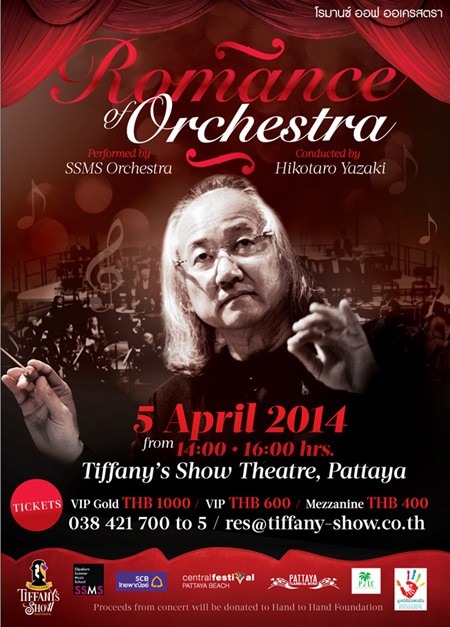 A full symphony orchestra will play a program of classical works at Tiffany’s on Second Road Pattaya. The concert is scheduled for 2pm on Saturday April 5th. A portion of the proceeds will be donated to the Hand to Hand Charity, one of the charity projects of the Pattaya International Ladies Club. The Silpakorn Summer Music School (SSMS) Orchestra, led by renowned Japanese conductor, Hikotaro Yazaki, will perform works by Richard Strauss, Wagner, Smetana and M.L. Usni Pramoj. The concert will feature Strauss’s Horn Concerto No. 1, performed by the winner of the Thailand Horn Competition 2014. The SSMS Orchestra is made up from the most talented music students in the country. They are selected by audition to attend the summer school, which is held in Sattahip, and to perform this concert. The performers have a high standard. Last year’s concert featured a performance of Rimsky Korsakov’s Scheherazade. The quality of performance was excellent and we can expect the same for this year. The concert is presented by Tiffany’s in conjunction with Pattaya International Ladies Club and Pattaya Classical Music. Tickets at 400 baht and 600 baht will be available from Tiffany’s on Second Road.